The COM465IP is a Condition Monitor with an integrated gateway. The intuitive COMTRAXX user interface provides a perfect system overview and allows simple and intuitive parameterisation of all connected devices. The user interface is based on HTML5 and is therefore future-proof and provides barrier-free access. The COM465IP transmits data of all devices in the system via Modbus TCP and SNMP. 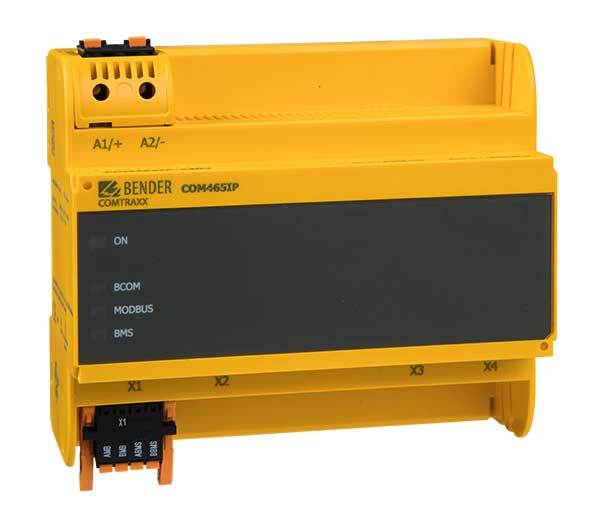 This allows requests of all Bender devices with communication capability, such as EDS, RCMS, MEDICS or PEM systems, to be integrated into a Modbus TCP or SNMP system. It provides several interfaces and can therefore integrate all Bender devices and also third-party devices into the system. The COM465IP is available in two versions: pure 24 V or 24 V-230 V.
In addition, the functionality can be extended by function modules. This makes it possible to adapt the device to the respective requirements.